The brown sweater now has 2 sleeves. No pictures today. Tomorrow it will go to work with me and hopefully get sewn together. It still needs edgings and beads. The July Mystery sock has one sock with Clue #2 finished. The other is up to the heel gusset. The Tour de Sox Yellow Jersey Sock is about 2" into the leg. I was asked "which tutorial/technique did you use for the toe up heel flap? i haven't found just the right one yet! I designed a pair of socks for TKGA's Cast On in December 2004. I used the same method for this one. I figured it our myself. I also figured out the "Star Toe" reverse. that one was easier. Dry wall has been installed. It is now all hung, I think. We still have some interesting areas of mess and the dry wall still needs more mudding and sanding. The toilet belongs next to the tub. The sink also was moved. 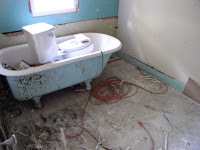 The two color wall is because the original plaster was left behind the tub. Tonight was Cleveland's Knitters at the baseball game night. Our Tribe won after 9 straight losses. Final score: Indians 13, Tampa Bay 2. This statue of Bob Feller is outside Gate C. He was a famous pitcher for our team in the 1950's.